DONETSK, Ukraine -- The newly elected leader of an area controlled by Moscow-backed separatists in eastern Ukraine has promised closer integration with Russia following polls denounced as a sham by Kiev and the West. "A course toward the Russian Federation will be continued," Denis Pushilin, the head of the separatists in the Donetsk region, said on November 14 in his first media appearance since the weekend elections. "This is not only cultural and social integration, but also economic," he said. "We have already learned to live without Ukraine." Kiev and its international backers said the November 11 polls in the areas held by the separatists in both the Donetsk and neighboring Luhansk regions would further hamper efforts to end a conflict that has killed more than 11,000 people since April 2014. However, Moscow argued that the elections would not violate the Minsk agreements signed in September 2014 and February 2015, laying out steps for settling the conflict. 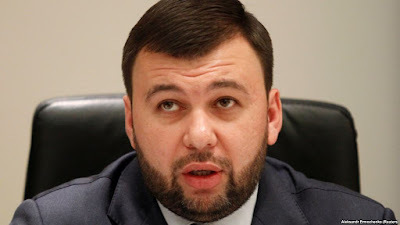 The separatists said on November 14 that the polls in Donetsk and Luhansk endorsed the two men who were already acting as leaders -- 37-year-old Pushilin and 48-year-old Leonid Pasechnik. The previous separatist leader in Donetsk, Aleksandr Zakharchenko, died in an explosion in August. Moscow pointed the finger at Ukraine, while Kiev blamed internal fighting between the separatists and “their Russian sponsors." Kiev's Central Election Commission dismissed the results of what it said were "illegal" votes in Donetsk and Luhansk and said the polls were simply an excuse for Moscow to cement its grip on the regions. The United States and other Western countries have condemned the elections as a "sham" and “illegal." However, the Kremlin said the regions had "nothing left but to self-organize" after being "abandoned" by Ukraine. Separatists seized territory in the Donetsk and Luhansk regions after a popular uprising ousted Moscow-friendly President Viktor Yanukovich in February 2014 and Russia annexed Ukraine’s Crimean Peninsula a month later. The West has imposed sanctions on Russia over its annexation of Crimea and its backing of the separatists. However, Moscow has repeatedly denied financing and equipping the separatist forces despite overwhelming evidence to the contrary, insisting that the fighting is a civil, internal conflict. Fighting in eastern Ukraine persists despite cease-fire deals reached as part of the Minsk agreements, and implementation of other measures set out in the deals has been slow.